When watching a concert, our focus is usually on the performers and the act on stage. I doubt many of us would instinctively place much attention on the backstage crew who diligently prepare the AV system, props, costumes and other necessary logistics. In fact, these people behind the scenes are no less important! They too, work hard and are essential to ensuring that the performance runs smoothly and is a great experience for the audience. Similarly, commuters of our public rail transport system hope to enjoy efficient and smooth services. That is natural and fair. However, many of us may not be aware of the sheer hard work put in by our rail maintenance crew (behind the scenes) each day and each night to keep our public rail transportation running smoothly in Singapore. Our Mass Rapid Transit (MRT) network is extensive. 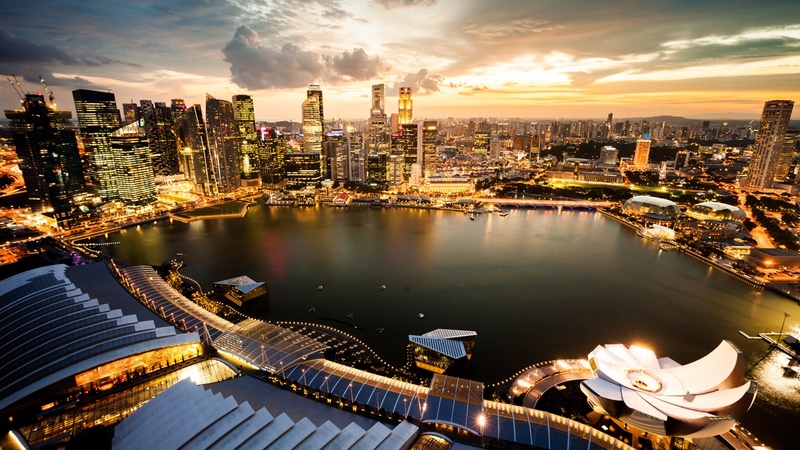 It comprises five main lines, the North-South Line, East-West Line, Circle Line, North-East Line (NEL) and Downtown Line. The total network length is about 178 km. We also have the Light Rapid Transit network. 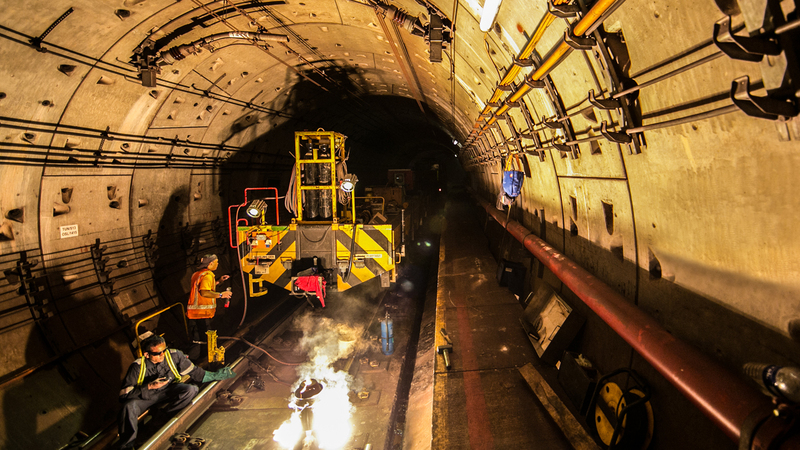 To service the entire rail network, we depend on six depots and a dutiful maintenance crew who typically work night shifts to take care of the trains and tracks. As the Executive Secretary of the National Transport Workers’ Union, I made visits to various train depots and tracks, both underground and overhead and had opportunities to interact with the maintenance crew. 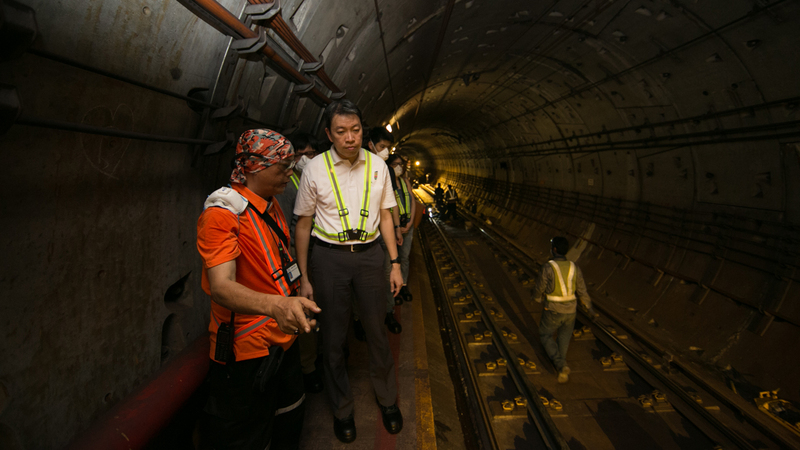 I was greatly humbled by what I saw – our workers’ pride, skills, determination and concentration in performing their work so that you and I can comfortably and safely enjoy our train ride the very next day. Their jobs are not easy at all. They face various challenges and I hope more can be done to help make their jobs easier, smarter and safer. The typical window for maintenance work is between 1.00am and 4.30am, when most of us are in dreamland. The long operating hours of the train stations do not offer workers the luxury of time to perform their duties. As such, majority of the maintenance work can only be done during the wee hours. I remember the NEL rail renewal process where workers had to complete the renewal of an 18-metre rail within three hours! Common feedback is that there is so much to do, but so little time. I’m glad that the Land Transport Authority (LTA) recently announced the early closure and delayed opening of certain train stations to provide our maintenance crew with more time to perform their duties. This is a small, but important step. To make their work easier, I hope that “more” working hours can be given to the maintenance crew. To mitigate the inconvenience to the commuters, perhaps more buses can be deployed to ply the affected routes. During my visits, it was encouraging to see productivity and innovation in action. 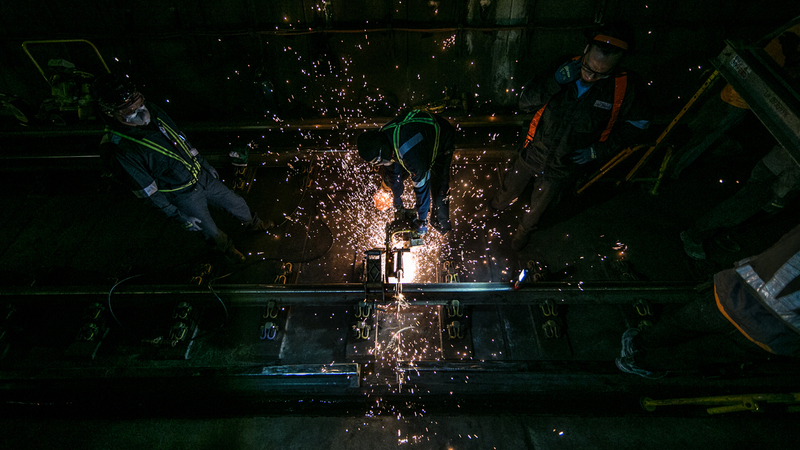 Workers make use of a modified track trolley in the train tunnels to reduce physical labour when performing track maintenance. There is also a vending machine at the worksite for workers to draw commonly-used tools and parts. This reduces the need and time to travel to and from the store which could be offsite or a distance away. However, there is still much room for improvement. Both operators and maintenance crew can do their part in brainstorming for ideas to improve work productivity. Certain work processes can be more age-friendly. I noticed that workers have to use great physical strength to lift and move equipment during the course of work. Given the ageing workforce, more can be done in the areas of work process re-engineering or re-design, in particular through automation and mechanisation. I made a learning visit to the Hong Kong MTR recently, and understood that they make significant investments in technology and innovation. They make use of robotic arms to replace heavy lifting. We could definitely learn from them. I remember a visit to Kim Chuan Depot (KCD), which is touted as the world’s biggest underground rail depot. I was merely walking around the depot and I was perspiring badly. At NEL underground tunnel, in the hot and humid environment, I broke into sweat too. The grinding of the metallic tracks and the thermit welding to join the tracks generated heat and smell. Those were not pleasant. But who am I to complain? 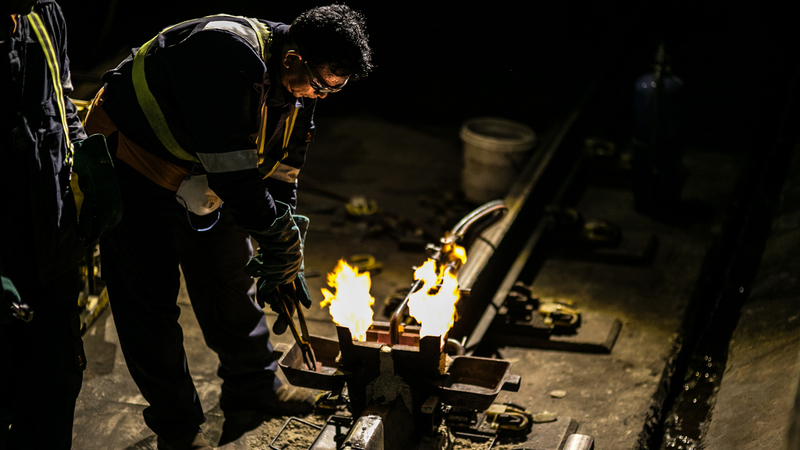 Our rail maintenance workers battle such working conditions on a daily basis, all for the greater purpose of ensuring that our trains and tracks are in good condition. Thus, I strongly urge the LTA and operators to look into improving the work environment of these workers, especially in ensuring that the air conditions do not pose a hazard to their health. Similar to what I had advocated in my earlier blog-post on bus captains, we need to do a holistic review of the working conditions of our rail workers too. I would like to appeal to the operators to conduct an annual health screening for these workers. We cannot take our workers’ health for granted. A healthy worker is a happy worker, and a happy worker is a better worker. As rail workers, they are exposed to workplace risks. They have to handle heavy equipment and work with live power lines. They cannot afford to be complacent and negligent during their work. According to Mr Kalisalvam, a Technical Officer doing power maintenance, the workers have to handle high electrical voltage in their maintenance work and have to follow strict standard operating procedures to prevent mishaps from happening. Workers who maintain the tracks, signals and power may have to access the track, if need be, during train operating hours. There are also workers who perform grinding of the rail as well as thermit welding which involves high heat. The SMRT rail incident on 22 March 2016 resulted in the death of two workers. Every workplace fatality is one too many, and we must prevent such tragedy from happening again. We cannot take workplace safety for granted. Having a short time window for maintenance work, to a certain extent, also adds to the pressure faced by the maintenance crew. This condition however, should not compromise the safety of our workers. The union will continue to emphasise the importance of workplace safety to our workers and remind the operators to reinforce their workplace safety culture. While service excellence is important, workplace safety should never be compromised. I’ve also come to understand that retaining newer maintenance crew members is more difficult than attracting them. The newcomers are often unable to acclimatise to the stressful and fast-paced work environment. The lean manpower situation doesn’t do retention efforts any favour too. The introduction of the Progressive Wage Model for rail workers by SMRT is one good initiative, as it helps attract potential jobseekers with transparent and attractive career progressive pathways in the rail industry. The upcoming Singapore Rail Academy will also play a key role in professionalising our rail industry and workers. However, more than that, we need to look at how we can help prepare the newcomers in their jobs. 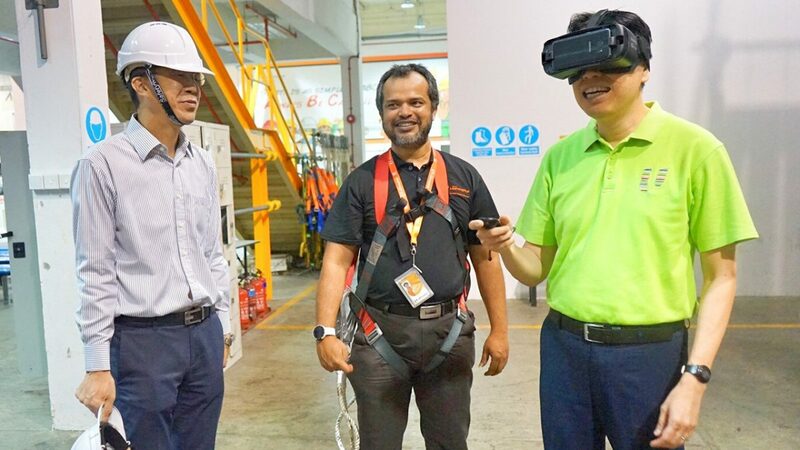 Taking a leaf from the Hong Kong MTR, their newcomers are put through a three-year structured mentorship programme which helps them acclimatise to the working conditions and give them more confidence to do their job well. Comparatively, our mentorship programme here ranges from three months to six months. Perhaps, that is something we can work on so that we can continue to attract new blood into the industry and better retain them. Bus captains are visible to us. It is easy for us to show our appreciation to them. Unlike the bus captains, our rail maintenance workers work behind the scenes. To me, they are the real (rail) unseen heroes. Let us appreciate them more. Kudos to them for all their efforts in making our rail transport system one of the best in the world! This is a post by National Trades Union Congress (NTUC) Director, Industrial Relations (Field) , Melvin Yong. Any extracts should be attributed back to the author. 26 May 2016.